Melbourne’s amazing Teeth & Tongue, aka Jess Cornelius, returned this year with Grids, a brand new album that got huge buzz, including Album of the Week at 3RRRfm, ABC Dig Music (now Double J), RTRfm and Beat Magazine. “Every time I make an album I swear it’s going to be a quick, easy, straightforward affair, but that doesn’t ever seem to happen,” says Jess Cornelius. “ When I came back from the USA at the end of 2012, I had a bunch of new songs that I’d written for the tour, and somehow the demos turned into the beginning of this new album, although it would take an entire year before we got close to finishing it”. 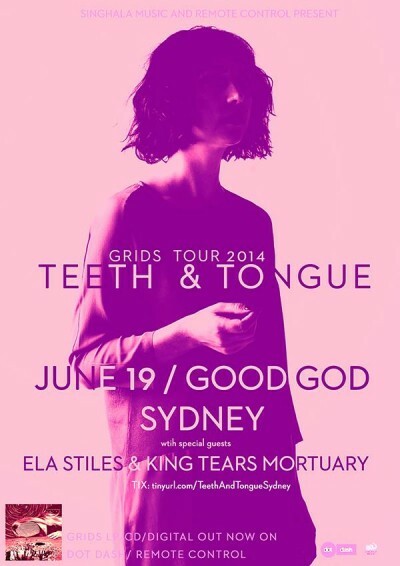 Now Teeth & Tongue brings her full band to the Danceteria, performing GRIDS in all its multi-layered glory. The band’s recent dance-heavy performances at Boogie Festival, White Night and a sold-out ‘Newborn’ release party have established Teeth & Tongue as much more than a solo act, and we can’t wait to welcome her to Goodgod!